Confirming a wave of reports saying that Fox News was in “emergency meetings” to figure out how to rid itself of conservative TV blowhard and alleged super-creep Bill O’Reilly, Variety has a statement from 21st Century Fox confirming that the network has, indeed, fired its most popular on-air personality. 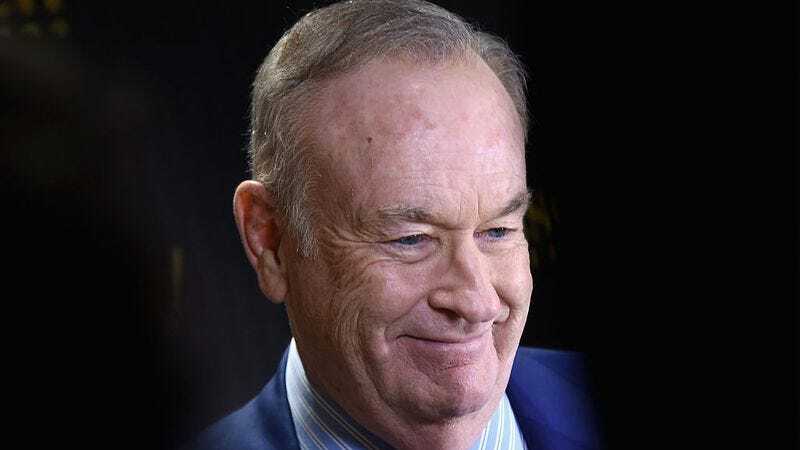 “After a thorough and careful review of the allegations, the Company and Bill O’Reilly have agreed that Bill O’Reilly will not be returning to the Fox News Channel,” the statement reads. O’Reilly, who has been accused of racial, sexual, and just plain old harassment by a number of former Fox employees, is currently on vacation in Italy. He’s set to return to the U.S. on April 24, at which point Fox will presumably have a cardboard box full of his belongings waiting for him on the curb. No word yet on who will replace O’Reilly in his prime 8 p.m. time slot on the network, or what will happen with O’Reilly’s contract with the network, which was recently renewed. UPDATE: Fox News has announced that Tucker Carlson will be taking over O’Reilly’s time slot. Meanwhile, Variety reports that a TV-movie version of O’Reilly’s book Killing Patton due in 2019 is still on at National Geographic channel—for now. “We’re focused on 2018 right now. We’re not making any decisions today,” a representative says. Publisher Henry Holt—the Macmillan subsidiary that publishes O’Reilly’s Killing series of historical non-fiction books—also says it plans to keep O’Reilly on its roster.